A witness is a neutral third-party who’s present during the signing of a document and does not have a monetary or otherwise beneficial stake in the document’s execution. He or she simply watches as the person or persons signs the document, at which point the witness will then sign the document. Witnesses to legally binding documents must be 18 years of age or older. It’s important to note that a witness is not required to understand the contents of a the document. 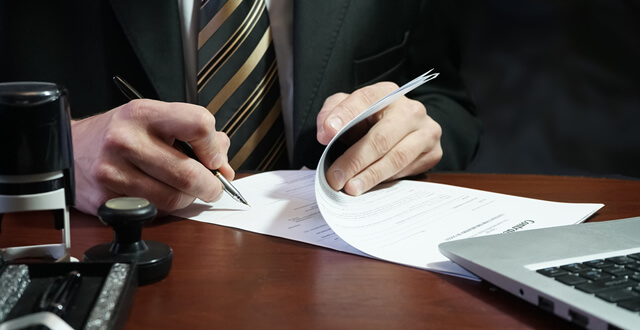 The sole purpose of a witness is to observe the person signing the document, which may or may not be done in the presence of the notary public, depending on the type of document. Most states allow notaries to act as witnesses to the execution of documents. In fact, it’s often a notary public’s duty to be a neutral witness to the signing of documents. With that said, there are a few things you should know about the notaries acting as witnesses to the signing of documents. First and foremost, notary publics are prohibited from notarizing their own witness signatures. This is viewed as a conflict of interest and frowned upon by the courts. If a document requires both the signer and witness’s signature to be notarized, the notary can still act as the witness but he or she won’t be able to notarize their signature. In the scenario mentioned above, the notary public may still notarize the original signer’s signature. If he or she acts as a witness, though, the notary cannot legally notarize their own signature. This is why it’s a good idea for clients to educate themselves on their respective state notarial laws, and if necessary, bring a friend, family, co-worker, or some other type of witness to the document’s signing. Depending on the state, either one or two witnesses may be required at the document’s signing. If the signing is performed in a state which requires two witnesses, the notary public will only count as one – assuming the state allows notaries to act as witnesses. A second witness who doesn’t hold a stake in the document’s execution must be present.